Image Transfer Review: Roger Deakins' impressive cinematography shines in this 2.35:1 anamorphic widescreen transfer, which conveys the bleak winter of Jesse James' final year. Some minimal grain exists, but it fails to distract much from the sharp imagery. A visual highlight is the train robbery, which envelops the gang in smoke and chaos to create a unique experience. Audio Transfer Review: This disc includes a 5.1-channel Dolby Digital track that effectively presents the story's mournful tone. The music from Nick Cave and Warren Ellis maintains the proper atmosphere and moves well throughout the room. The sounds of the open prairie also stand out, though the complexity falls just short of the premier transfers. Extras Review: Warner Home Video deserves a serious slap on the wrist for this film-only DVD release. 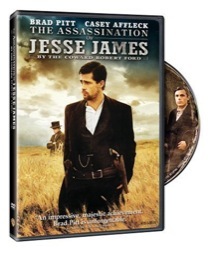 Numerous possibilities exist to explore the history of Jesse James and this film's production. I'm certain that a two-disc special edition will appear sometime this year, which makes this version a shame. This release includes scene selections and some pre-menu trailers, and that's all. Brad Pitt's star power wasn't enough to generate box-office interest in the lengthy epic The Assassination of Jesse James by the Coward Robert Ford. It lacks the crowd-pleasing action of the recent 3:10 to Yuma and takes a revisionist look at the Western myths. The film is seriously uneven, but it's worth a rental if you're searching for a different take on the genre. This extremely limited DVD release isn�t worth a purchase, so fans should definitely wait for a more worthy option.